NoBusiness Records, based in Lithuania, is one of the most significant labels operating today in the field of free jazz, focusing on both new projects and archival, usually live, recordings. In early 2017, NoBusiness inaugurated a new series in collaboration with another label that shares the same operational strategies, the Japanese Chap Chap Records. Active since the early Nineties, Chap Chap has released both new works (like the fundamental Golden Hearts Remembrance by Wadada Leo Smith), and valuable archival recordings (Sabu Toyozumi with Han Bennink, Motoharu Yoshizawa with Evan Parker, Mototeru Takagi). The first volume in this new series is in a way a mirror of the collaboration itself, as it features two musicians from opposite parts of the globe. 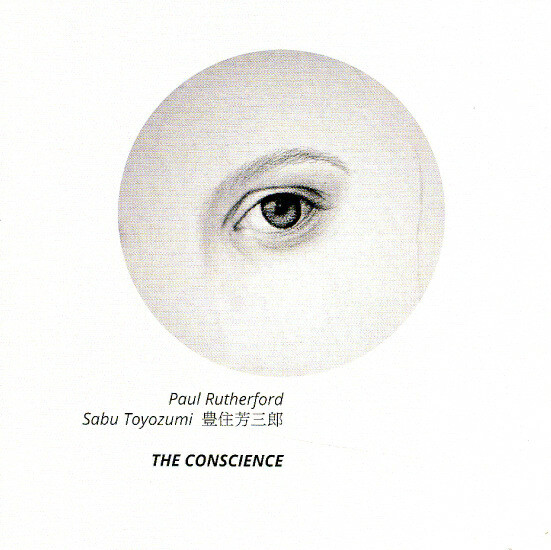 The late Paul Rutherford, an early practitioner of free improvisation in England in the early Seventies, helped define the very essence of European free music; Sabu Toyozumi is one of the protagonists in the excellent, and still little known, Japanese free jazz scene from the same period, and he's still very much active to this day. The live recording contained in The Conscience comes from a concert held in 1999 at Cafè Jumbo in Tokoname, Japan, and it was originally meant by Sadamu Hisada, the concert promoter, as a simple documentation of the event, with no intention to release it. The sound quality betrays its origin, with a slightly uneven mix that sometimes risks covering the subtler aspects of the music, Rutherford’s nuanced playing in particular. However, these are minor deficiencies, and the recording quality is in general more than adequate. Rutherford and Toyozumi already recorded together the year before, a session that would be later self-released by the drummer on the record Fragrance. This previous experience was clearly beneficial to the performance at hand: building on a common language based on free jazz, while pointing to even more abstract territories, the musicians demonstrate an immediate understanding of each other's playing, building on an urgent, unrelenting exchange of ideas. The record consists of a constantly changing free-form improvisation, divided in five tracks that share the same basic traits. Trombone and drums often proceed in parallel directions, suddenly locking in tight rhythmic exchanges or diverging in abstract textural explorations. The absence of a clear direction is disorienting at first, but the richness of timbres and dynamics explored by the musicians guarantees the strong involvement of the listener, called to decipher the intricacies of their improvisational dialogue, its contradictions and mysterious flow. The Conscience is a prime example of free music at its most daring, an ever-changing musical landscape where the only constant is surprise.